Today is Scout's Honor Pet Adoption Event in the Heights, so Pixie is on an outing. If you're in Houston, go by and see all their wonderful animals available for adoption. 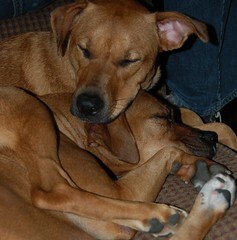 This is a great photo Lindsey took of Pixie sleeping on top of her BFF, Sugar. These two have such a fantastic time playing together. Lindsey hopes that Pixie's forever family will want to set up play dates for the two of them. Going to your local brick-and-mortar store would be a great way to celebrate National Bookstore Day. Remember to be kind to your booksellers, who provide the best links between you, writers, and the nourishment of your imagination. It's a good day to post a photo of your favorite local bookstore or tell a story about why it's special to you. My favorite Houston independent bookseller, Murder By the Book, will be hosting Greg Herren's signing for Murder in the Garden District at 4:30 today. That's where The Compounders and The Brides will be. Join us!